No review books in the mail last week which is a good thing because I'm working on the creative writer's workshop I am giving starting next week. The new year is starting with a bang! However, I did get a book from BookMooch. By the way, this meme is hosted by Marcia at The Printed Page. You should check out her blog and see what others have received and to play along. I first heard of this man's experience when reading At The edge: Daring Acts in Desperate Times by Larry Verstraete. I was so moved by his story that when I saw this book on another blog I checked to see if I could mooch it from BookMooch. And I did! Concise and yet packed with detail, Touching the Void, Joe Simpson's harrowing account of near-death in the Peruvian Andes, is a compact tour de force that wrestles with issues of bravery, friendship, physical endurance, the code of the mountains, and the will to live. Simpson dedicates the book to his climbing partner, Simon Yates, and to "those friends who have gone to the mountains and have not returned." What is it that compels certain individuals to willingly seek out the most inhospitable climate on earth? To risk their lives in an attempt to leave footprints where few or none have gone before? Simpson's vivid narrative of a dangerous climbing expedition will convince even the most die-hard couch potato that such pursuits fall within the realm of the sane. As the author struggles ever higher, readers learn of the mountain's awesome power, the beautiful--and sometimes deadly--sheets of blue glacial ice, and the accomplishment of a successful ascent. 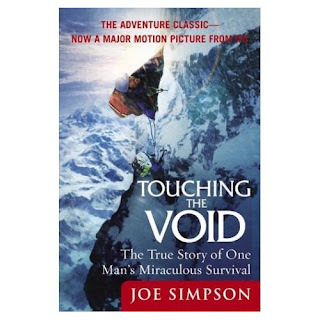 And then catastrophe: the second half of Touching the Void sees Simpson at his darkest moment. With a smashed, useless leg, he and his partner must struggle down a near-vertical face--and that's only the beginning of their troubles. Love the cover, it sounds like something I'd like to read! Wow! Sounds like an intense, fasinating read. Happy reading this week! That looks like a page turner! I love true stories. Enjoy! If you enjoy this book you should rent the movie. It's very good I hear. Happy reading! This look like a great read! Please visit my new inbox!